10 Things You’ll Only Get If Your Guy Loves The Gym! There are very few people who take the gym and working out seriously. But, few as they are, these people always try to convince us lazy bums to change our lifestyle. And if the gym rat happens to be your boyfriend, you have absolutely no choice but to change. 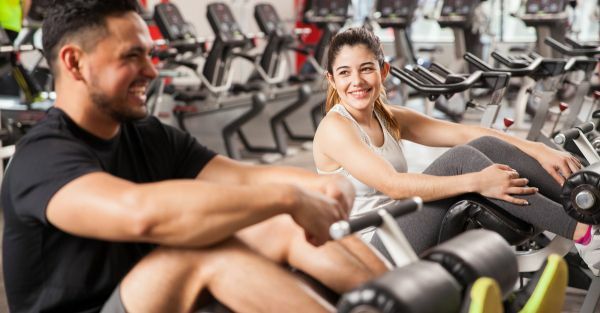 Here’s a list of 10 things that you will totally relate to if your boyfriend is a fitness freak! When he isn’t cuddling with you or holding your hand, he will probably be found in front of the mirror, usually shirtless, flexing all the muscles on his torso. He might be two sit-ups away from a six pack or maybe two years away from it, but he WILL still ask you if you can see it! Either way, you suppress your urge to laugh and distract him saying “Jaanu, come let me take some pictures of you and your muscles...” And you know this method works because your pyaara gym freak loves his hard work to be photographed! Your man’s got the knowledge of all the best fitness apps available. He’s even downloaded a few for you on your device! And he loves his FitBit Blaze - his most prized possession. He likes how it gives him data about not only the number of steps he takes but also the distance he has walked, his heart rate AND text notifications! Must admit, it's easy to fall in love with it. You can’t decide whether it’s a good thing or bad thing that his habits are rubbing off on you - like his habit of counting calories! Eating out? It probably takes you ages to decide because you’re busy counting the calories of prospective meals you want to order. But whatever you end up ordering, trust that your man’s judgmental eyes will be on you! There might be days when the two of you talk about your future together. You might discuss the city you would like to live in and the kind of house you would like to have. You probably dream about a grand walk-in closet or a cozy library, but him? All he wants is a personal gym! If you let him talk about it long enough, he might get over excited and maybe even start calculating the money he will need for all the equipment he plans to buy. Calm down, boy, calm the eff down! Your dates do not revolve around fine wines and exotic meals anymore. They’re mostly about places where you can go and work out together. And the most welcomed third wheel to your date - his FitBit Blaze. It tracks all the activity you’ve done and gives you a sense of accomplishment. You can pretend to hate it, but you know the exercise is doing wonders for you! 8. Porridge and oats, ladies! No more pancakes and buttery parathas for breakfast anymore. It’s all porridge, eggs and oats according to the new drill sergeant you’re dating. Your taste buds will protest for days but there isn’t anything you can do about it! Your man might have wooed you with words dripping with love and wonderful conversations that seemed endless. But that’s ancient history now. These days all you hear are details about his gym, the clothes he has ordered to wear to the gym, all the great features of his FitBit Blaze, which is his second love (hopefully still second!) and meal plans for the both of you. If your man has been hitting the gym more often than before, treat this as a warning sign! He always makes you feel guilty about missing a day at the gym. Also, he keeps talking about how great he is feeling after his workout, so now you feel guilty AND jealous! And to make you feel better he tries giving you his usual motivational speech about fitness and health and the gym. But he mostly just ends up motivating himself! :P * This is a sponsored post for FitBit Blaze.